Despite being a busy Rector's wife, Mrs. Clinton (Adele) Locke of Chicago, still managed to find time to pursue an extremely active interest in her hobby of cat keeping and breeding, including being one of the most active importers living on the American continent, and certainly one of the earliest. Mrs. Locke was one of the most active importers on the North American continent. During the 1890's Mrs. Locke traveled to the British Isles on a number of occasions, attended shows and visited catteries, establishing valuable long-term ties with the likes of Lady Marcus Beresford and Miss Frances Simpson amongst others. 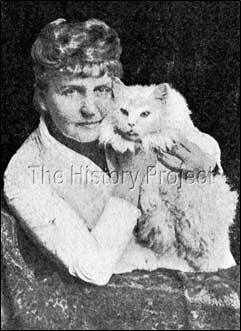 Mrs. Clinton Locke (Adele), President of the Beresford Cat Club, with her first import,'Wendell' ,born in Persia, in 1876. From the number of 'Rosalys' progeny which were successfully distributed and shown, it would seem that she was a relatively reliable breeder. After a number of years with Mrs. Clinton Locke, she appears to have taken a hiatus (or had a period during late 1898 when she was effectively leased) to Miss Lucy E. Nichols, of Waterbury, Connecticut. During this sojourn, she took the name 'Ben-Mohr Rosalys'. After that litter, she then must have been returned home to Mrs. Clinton Locke, as she produced a final litter for her former mistress, in March 1899. There is currently no evidence that 'Rosalys' had any siblings that were retained by Mrs. Foote for breeding. Upon her exportation to Mrs. Locke, (likely to have taken place in 1895), she then was kept busy as a brood queen in Chicago until the middle of 1898. While with Miss Lucy Nichols, she seems to have been exhibited successfully at the Beacon Valley Agricultural Society Fair of September 1898 and there taken a first in her class. It is as a breeder that 'Rosalys' had her greatest impact on the bloodlines in North America at the time. From her first recorded litter to 'The Beadle' in 1896, came her own namesake, a blue female appropriately named 'Rosalys II' (BCC 133). This girl was retained by Mrs. Locke for breeding, and a number of well-known progeny can be attributed to her, among them, 'Prairie Rose Roscoe' (BCC 116), a white male, and his sibling 'Lockehaven Prince Colburn', a Black Bi-Colour, born in 1898, sired by the white male, 'Elton II'. In another litter, born in 1899, was 'Bonnylea Amytis' (BCC 166), a Silver female sired by 'Smerdis' (BCC 130). In her second recorded litter, also by 'The Beadle', which was born on 3rd April, 1897, came the blue male, 'The Bumble Bee', also later known and re-registered as 'Bumble-bee Bumble Bee'. His first name was given to him in deference to his sire 'The Beadle', whose original name while residing in England had also been 'Bumble Bee'. His double nomenclature resulted from his eventual sale to Mrs. Lincoln Nicholson of Illinois, whose cattery name, just also happened to be 'Bumble-Bee'!!! In his turn, the young 'Bumble Bee' became a well-known, popular and successful sire, passing on the combined lines of 'The Beadle' and 'Rosalys' to another generation of foundation stock. By continuing to put her two English-bred cats together, Mrs. Clinton was able to offer other breeders the option of a 'home-bred' cat of pure 'English' bloodlines, just as if they had imported it themselves. 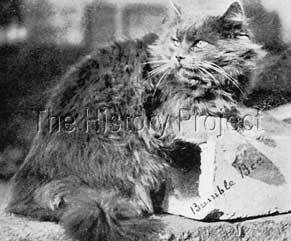 Lord Ruffles was "one of the finest blue cats ever seen in this country." A repeat of the breeding again produced a litter on 26th April, 1898, this time including two blues, a male and a female that would go to other breeders. The male, 'Lord Ruffles' (BCC 116) was sold to Miss Cora Wallace, of East Brady, Pennsylvania. In her book Concerning Cats (1900), Helen Winslow makes the following observation of 'Lord Ruffles': "one of the finest blue cats ever seen in this country, son of Beadle and Rosalys". 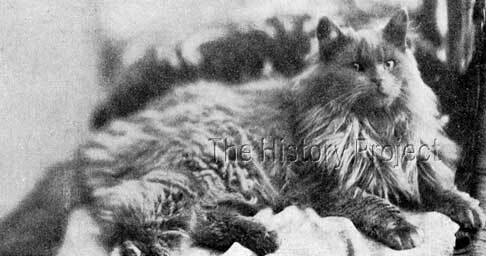 The female from this litter, was a blue named 'Cherie',(BCC 104) who was subsequently sold to Mrs. C. J. Hambleton of Chicago, and shown in the first Chicago Cat Club Show in December 1898. 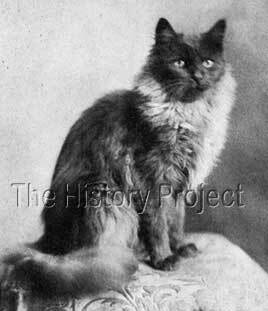 At the Chicago show she won a first, but she later changed hands and name, becoming the property of Miss Lucy C. Johnstone, who exhibited her at the Beresford Cat Club show of 1900, as 'Madison Cherie' where she was awarded a 2nd and a Special. Full litter siblings 'Lord Ruffles' and 'Madison Cherie', sired by 'Ch. The Beadle' and out of 'Rosalys'. Roscal is "the most perfect 'lavender blue' cat in America." The only unreconciled fact raised by the registration of this pair is their date of birth, which is recorded for both as 7th June, 1898. Given that the previous litter registered from 'Rosalys' by Mrs. Clinton Locke, was born on 26th April,1898, that would make the birth of this litter on the 7th June a physical impossibility. The next litter from 'Rosalys' was born on 11th March 1899, so we can of course speculate that Miss Nichols just registered them with the wrong date and that a more realistic date night be 7th July for instance, which although close , would still be possible, whilst also remembering that we have a record for 'Rosalys' being entered into the Agricultural Fair in September of 1898. Whatever their effective date of birth may have been, they both clearly captured the eye of admirers and 'Rosalys' fame as a brood queen was bolstered once more. The sire was once again 'The Beadle', so we can only presume that Mrs. Clinton Locke was happy to do Miss Nichols this great favour, by allowing her to take her imported female , in kitten to her stud. If in fact the error is that the breeder is incorrectly recorded in the register, then we are still left with the contentious issue of the date of birth. 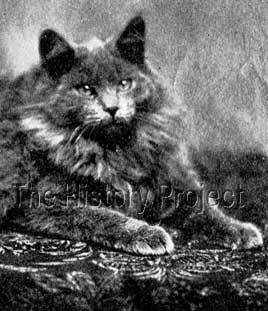 In any event, we are fortunate to have a photograph of 'Roscal', provided by Helen Winslow in 'Concerning Cats, which certainly is very suggestive of his powder-blue colour. In summary, this delightful blue female, imported from Mrs. Foote in London, became one of the mainstays of the Blue Persian breeding program at the famous Lockehaven Kennels during the last five years of the nineteenth century. That she was a consistent producer of show quality progeny was a credit both to her breeding and to the successful combination with 'Ch. Beadle'. In short, she was one of the most successful blue brood queens of this early period in the United States, and as such, did much to raise the profile and respect for this colour variety on the western side of the Atlantic.